MARQUETTE — Ladies and gentlemen start your tractors. The largest indoor tractor showroom in the U.P. has officially opened their doors with a ribbon cutting ceremony in Marquette. 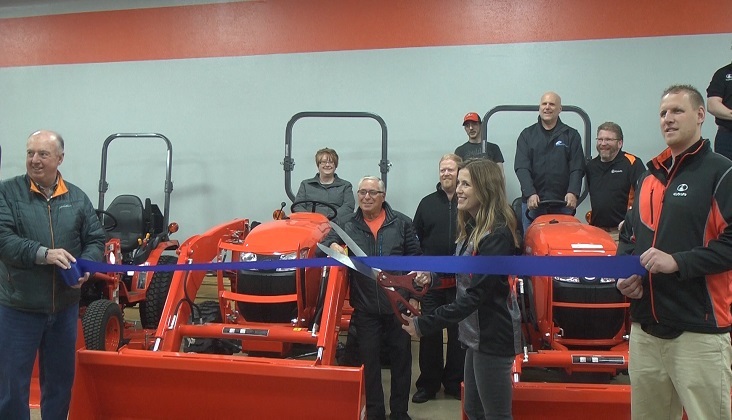 Kubota has joined the Marquette Township business Association, where the Association granted them their first dollar to help designate their beginning here. Kubota has a lot more to offer than just their showroom. “The heart of Marquette township business community is the small businesses like U.P. Kubota. They come in here and they’re really the back bones of supply services and products, for all the people that come in here to shop in our area,” said Frank Stabile, Chairman of Marquette Township Business Association. “We are a full service dealer so in addition to selling the machines, we set them up here. We service existing Kubota’s, we carry a large inventory of Kubota parts and accessories. This truly is a one stop, everything you could need for your Kubota is right here at U.P. Kubota in Marquette,” added Sean McAdam, General Manager of U.P. Kubota. Kubota encourages people to come down for their open house tomorrow from 2:00-5:00 P.M. to see their new showroom or to even test drive a tractor for a little fun. Kubota is located at 4250 US-41 West in Marquette.